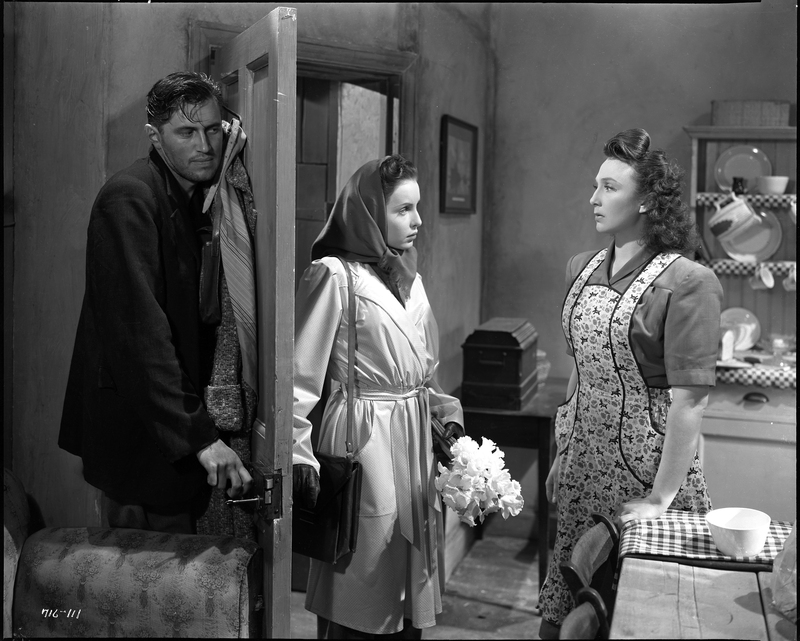 John McCallum, Patricia Plunkett (stepdaughter Doris) and Googie Withers in Robert Hamer’s IT ALWAYS RAINS ON SUNDAY (1947). Photo courtesy of Rialto Pictures. This welcome digital restoration by the BFI brings one of Ealing Studios’ best releases back into UK cinemas. It’s a thoroughly entertaining film offering a range of different pleasures and represents the peak period of Ealing’s output very well. Reading up on the coverage of the re-release however, I think that some of the writing could be misleading about the British cinema of the time. British reviewers refer to this as a ‘precursor to kitchen-sink dramas’ and American reviewers seem to focus on the film noir aspects. Both descriptions have some validity but the film is a mix of genres and the same elements can be found in several British films of the period – other Ealing films and also titles from Gainsborough and other studios. The East End depicted here is not the ‘near slum housing’ and desperate hand-to-mouth existence that some reviewers discuss. It’s a thriving working-class community making the best of enjoying life in ‘Austerity Britain’ (much like the present in fact!). Having said that, there is evidence that some of the residents of Bethnal Green objected to the depiction of their neighbourhood – an indication of a time when audiences were less used to seeing their locality on screen perhaps? The film is notable for many other reasons, including its presentation of Ealing’s biggest star of the period, Googie Withers, and the direction by Robert Hamer, one of the leading Ealing directors alongside Sandy Mackendrick. The cast is chock-full of British character actors and for those of a certain age offers a treasure trove of remembered performers. The camerawork from Douglas Slocombe is very good, though the budget constraints are obvious and models had to be used for some of the action scenes. 1947 was the year after British cinema audiences peaked at 1.6 billion admissions and there were 30 million cinema visits a week. Production levels were still relatively low, so Ealing did well to release five films in 1947. Googie Withers starred in two of them (the other being the ‘realist historical’ drama The Loves of Joanna Godden in which Ms Withers is an Edwardian farmer on Romney Marsh). It was a vintage year since the other three films were Basil Dearden’s fine Frieda (in which David Farrar brings home from the war a German bride – to the consternation of his family), the Charles Crichton comedy Hue and Cry and Cavalcanti’s Nicholas Nickleby. It Always Rains on Sunday came out late in 1947. Film Review considers it as a 1948 film and reports that the Daily Mail Readers Poll made it one of the 10 most popular British films of the year with Googie Withers and her co-star (and new husband) John McCallum similarly honoured. Film Review also makes what I think is the best critical summary in saying that: “This careful, observant study of East End life bore the touch of genius. Its characters were believable, its actions normal and its background authentic.” The first half of 1948 was an unusual period in British cinemas since a dispute with Hollywood meant that no new American films were released, leaving the field open to British films. Perhaps audiences had more chance to discover the qualities of home-grown films? The family melodrama: after a violent argument with her stepmother Vi (Susan Shaw) has a torn dress – a reference to the cheap austerity clothes? Edward Chapman, the girls’ father is coming up the stairs. It Always Rains on Sunday details one day in the life of East End housewife Rose Sandigate (Googie Withers). Her Sunday routine is disrupted by her discovery of her ex-lover Tommy Swann (John McCallum) hiding in the wartime Anderson shelter in her backyard. He’s broken out of gaol and come to her as the only person he can trust. She hasn’t seen him for ten years but feels compelled to keep him safe despite the need to hide him from the older man she married after Tommy’s capture, her two stepdaughters and her young son. This is the central plotline of the film but there are several sub-plots, mostly involving the two stepdaughters (the elder of whom is played by the Rank starlet Susan Shaw), three petty crooks and a Jewish extended family including such archetypal figures as the amusement arcade owner and ‘fixer’, the musician/record shop owner and the charitable worker. (Bethnal Green had a long-standing Jewish community, also represented in other films of the period.) The script by Ealing regulars Angus McPhail and Henry Cornelius, alongside Hamer and taken from a novel by Arthur la Bern, is full of witty exchanges and the film fairly zips along through its 92 minutes. Why has this film survived so well while dozens of others from the period have virtually disappeared? It is a good representation of community and that was an important part of Ealing’s success. As George Perry points out (Forever Ealing, Pavilion Books 1981), Ealing’s peak years of 1945-51 exactly match the Labour government of Clem Attlee which did more than any UK government before or since to foster the sense of ‘doing things together’ through nationalisation of major industries and the expansion of the welfare state. Ealing’s films in this period, though never overtly ‘political’, often feature communities coming together to fight for something or at least being represented as having a sense of living and developing with a collective responsibility. Bethnal Green is presented as a place where people are ‘known’ – whether because they help others or because they are up to no good. Jack Warner’s CID man knows everybody and especially the petty crooks. A classic noir image from IT ALWAYS RAINS ON SUNDAY (1947). Photo courtesy of Rialto Pictures. It Always Rains on Sunday includes several scenes that regularly recur in British films of the period. The action scenes are familiar from I Was a Fugitive (1947) (the escaping prisoner) and numerous films in which police cars with tyres squealing race through East End streets. The chase across the railway marshalling yard is a staple of British crime films and the East End dockland roads with their high walls are perfect for the entrapment of the doomed man. The scenes of cramped family life in a terraced house are similarly familiar but Googie Withers stands out as a genuine film star with real presence. She seems right for the period with that shapely, strong and powerful body and that wonderfully-sculpted mane of hair and she commands the screen. Ealing needed a female star of this magnitude to compete in a period when female stars ruled British cinema (this was the era of Anna Neagle, Margaret Lockwood, Deborah Kerr, Phyllis Calvert, Jean Kent, Patricia Roc, Ann Todd and many more). I would contend that the greatness of the film resides in the combination of script, star performance and overall ‘quality’ of the Ealing production, both technical and creative. I include in that reference to quality the work of Robert Hamer, but I wouldn’t want to single him out quite as much as some of the high-profile commentators have done. Hamer and Mackendrick are usually singled out as the star directors at Ealing and there are various publications and online resources devoted to them. I’m a supporter of the ‘Ealing as community’ school but Hamer is definitely worth investigating on sites like Screenonline and this Criterion essay by Philip Kemp. Kemp suggests that Hamer was attempting to bring the poetic realism of Marcel Carné to the East End in It Always Rains On Sunday. I’m not sure about that but the film is as important as those French films in its combination of art and entertainment. This entry was posted in British Cinema and tagged Ealing Studios, Googie Withers, Robert Hamer. Bookmark the permalink.